The Neuron Gain Intelligence is the latest offering from Neunaber Audio, and it’s arguably the most ambitious release yet from the Southern California based builder. The Neuron is essentially a gain stage preamp with noise gate, presets, MIDI, and a built in speaker simulator. It promises a wide range clean and distorted tones and comes in a compact package that makes this pedal all the more enticing. The Neuron is also unique in that its creation has been somewhat of a collaborative effort between Neunaber and the musicians who were able to test the pedal during different phases of its development. Let’s recount a bit more of the story behind this pedal and discuss what it offers in detail. Back at The NAMM Show 2018, Neunaber had a mysterious pedal on display – the Neunaber XD-1 Prototype. “I used to work for a guitar amplifier company, where I designed a modeling amp. I wanted to take what I learned – then and in the twenty years since – and create a new drive circuit. Although inspired by tube amps, this drive would push beyond what is possible with tubes and transistors. I thought that was a very compelling way to step into the unknown with clear goals while inviting feedback and criticism with the goal of improving and refining the XD-1 concept. I was greatly impressed by the sounds of the original XD-1, particularly the pedal’s higher gain sounds. But at that early stage of development the two-channel XD-1 still needed more work on its milder overdrive and clean sounds. 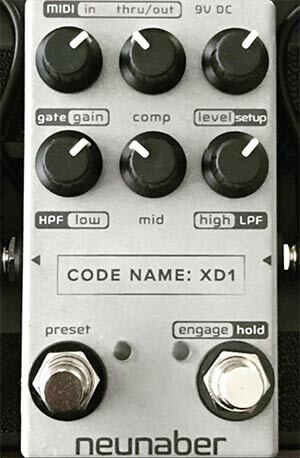 Armed with plenty of feedback from NAMM Show goers, Mr. Brian Neunaber went back to the lab and began refining the XD-1. This version showcased the near final hardware design with an array of 6 knobs, twin foot-switches, MIDI I/O, preset functionality, and a redesigned sound engine that did away with the original XD-1’s simple Blue Gain & Red Gain channels in favor of a seamless architecture that could morph between the pedal’s range of clean, overdriven, and distorted textures. 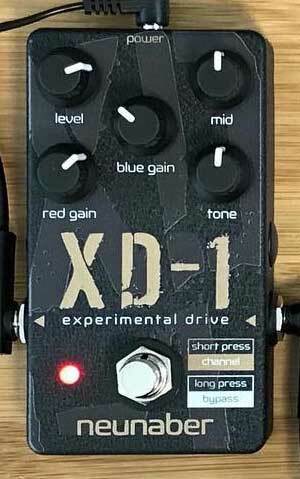 The new XD1 was a decidedly more impressive incarnation of Neunaber’s drive pedal concept, and when the final iteration was revealed at The NAMM Show 2019, the newly named Neuron was easily among the very best pedals of the show. So let’s talk about how the Neuron sounds and what makes this pedal so special. Visit Neunaber for more info about the Neuron. 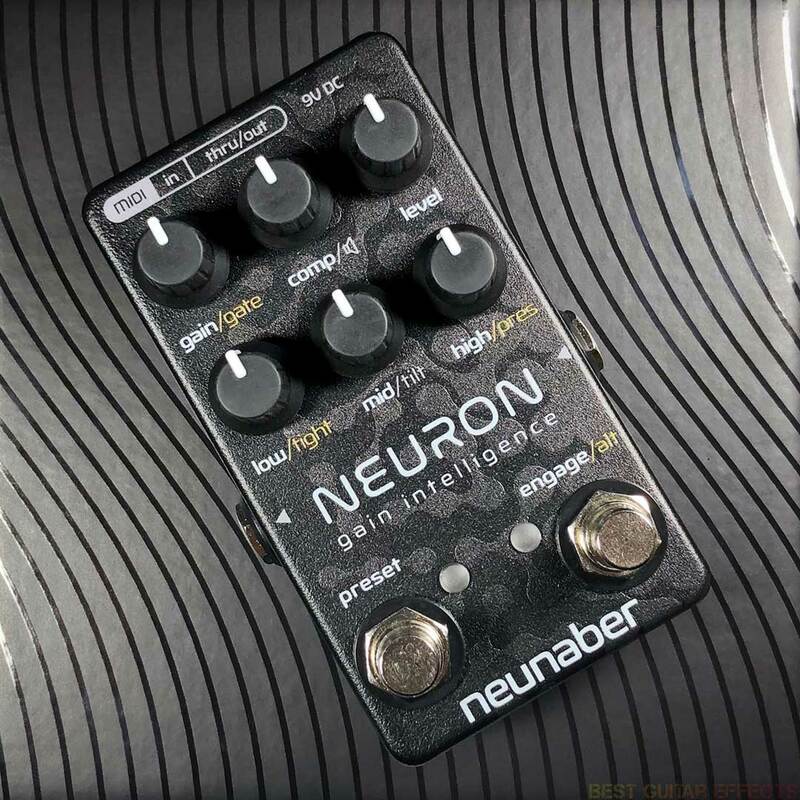 Neunaber’s Neuron product page mentions that the pedal covers “sparkling clean to heavy distortion and everything in between”, and indeed, the staggering range of sounds in this pedal warrants attention if versatility is important to you. While the Neuron does offer sounds that span a wide range of clean, overdrive, distortion, and full-on amp style saturation, it draws subtle sonic comparisons to many notable gain structures while not necessarily seeking to emulate anything that has come before. Still, you’ll quickly discover a range of sounds in the Neuron that provides an alternate history lesson of classic and modern tones. Creating sounds with the Neuron is very intuitive, with the Gain knob being the most powerful tone shaping tool on the pedal. With the Gain set counter-clockwise, you’ll hear the cleanest sounds the pedal offers. As you raise the Gain, you’ll venture through overdrive and distortion territory. At the higher end of the Gain spectrum, you’ll be treated to an amp-like roar of distortion that begs you to unleash your heaviest riffs and ripping leads. It’s important to emphasize that the pedal has a very responsive and dynamic playability throughout the spectrum of Gain settings, so it always seems to remain perfectly playable. The 3-band EQ section facilitates an expected contouring of the low, middle, and high frequencies, but what’s fascinating is that the EQ bands don’t affect the adjacent frequencies. The tone-stacks of classic amps are known for interactive EQ bleed, but the Neuron avoids such interactions which arguably makes its EQ much more effective for precisely shaping tone without having to potentially re-adjust other parameters. This design approach is more akin to an EQ you’d use in the studio for precise sculpting of recorded audio material. The Neuron’s Tilt EQ is an interesting addition, particularly because of how Neunaber recommends using it. It’s essentially a global setting that lets you contour the overall sound of the pedal to your rig. A slight adjustment of the Tilt EQ can give you a generally good starting point before you start creating your user presets. Then when you do happen to use the Neuron with another amp or in a different configuration, the Tilt EQ can be used to re-balance your overall sound with the new setup, which should prevent you from having to dial in all your presets all over again. The Comp function is another useful addition that adds to the feel of the Neuron. It can be set at minimum for no compression or cranked to put a heavy squeeze on your sound. I find myself often favoring it in the range of 8-11 o’clock for various clean and distorted sounds. I really like how it evens out the overall dynamics to help create smoother saturated tones. The Preset & MIDI functionality is a very welcome addition to the Neuron. I’ve long wished that Neunaber’s pedals had MIDI control and MIDI preset recall functionality. 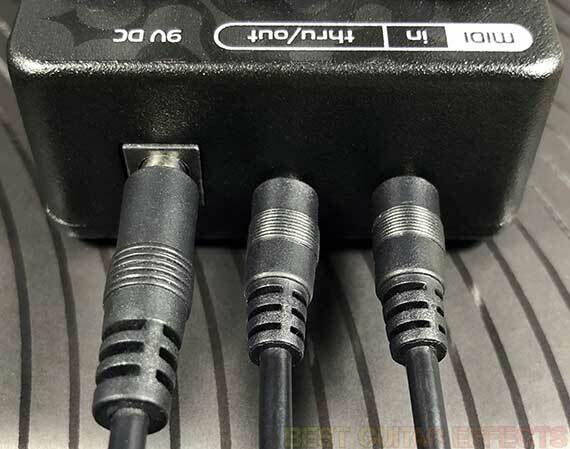 Neunaber opted for micro 2.5mm to 5-pin connectivity, and thankfully, the pedal comes with two adapter cables which let you route MIDI in and out/thru the Neuron. In my testing the MIDI seemed stable, and I was even able to automate multiple parameters from Ableton Live to morph the sounds of the pedal while playing different song sections on guitar. It’ll be intriguing to see how Neunaber implements MIDI in upcoming releases. Here are Neuron’s 2.5mm cables connected to the pedal. 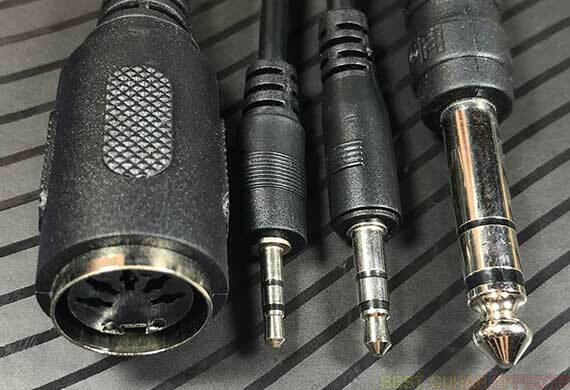 Notice the size of a standard 5-pin MIDI cable compared to Neuron’s 2.5mm TRS plug, a 3.5mm plug, and 1/4” plug (left to right). The Neuron’s Gate is functional and useful although I do wish the pedal offered greater control over the Gate’s response. This is the one minor complaint I have with the whole pedal as I wish the Gate could be tightened to respond more quickly as the Gain is increased. Of course, minor changes like these could be made via software, and I wouldn’t be surprised if Neunaber finds subtle ways to tweak the pedal with future firmware updates to make the Neuron respond even better in various ways. Still, the Gate is technically effective at cutting any signal noise between your playing, so it is a useful and welcome addition. The Neunaber Neuron can be your complete amp-in-a-box solution, add more virtual channels to your existing amp, or even simply be used like an EQ, overdrive, or distortion pedal. It’s easily one of the most versatile compact drive/preamp pedals ever made, and users who take advantage of the Neuron’s onboard preset recall and/or use a MIDI effects switcher to access multiple sounds will find a lot of utility in this outstanding pedal. 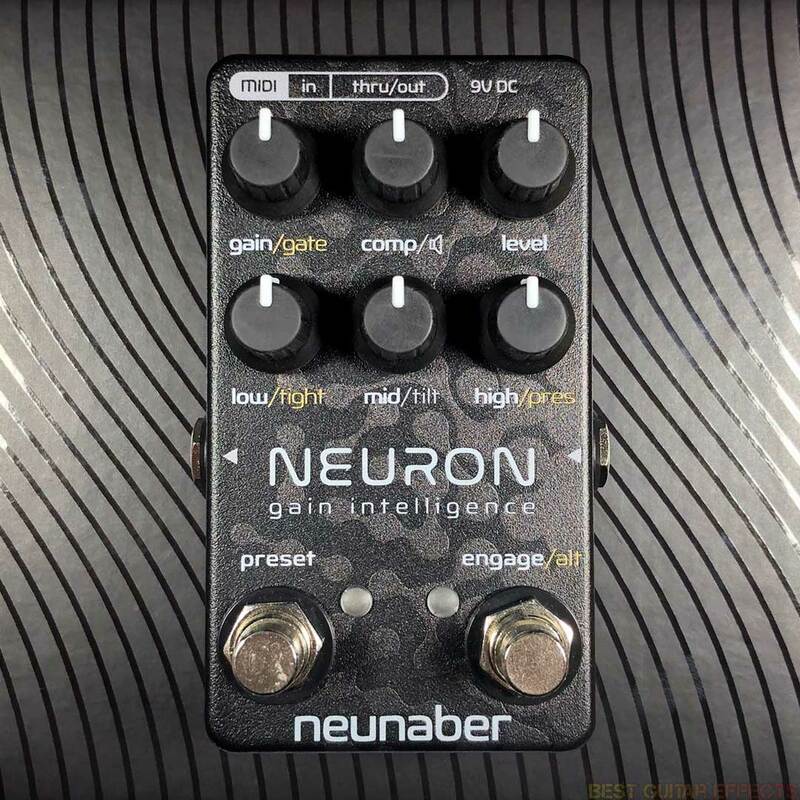 The Neuron is also an excellent example of how Neunaber not only pushes their sound design but also seeks to refine their hardware to meet the needs of modern musicians. In short, this one isn’t coming off my pedalboard anytime soon, and anyone seeking a new compact gain solution should try the Neuron for themselves. That concludes our Neunaber Neuron review. Thanks for reading.